On this private walking tour through Midtown Manhattan and cover some of the most famous landmarks in New York City, including the Chrysler Building, Grand Central Terminal, NY Public Library, Rockefeller Center, Bryant Park, Times Square, Park Avenue, Waldorf Astoria, and Saint Patrick's Cathedral. Learn about these world-famous buildings and places in an intimate group setting without microphones, flags or memorized scripts. Your private walking tour begins by showing off the beautiful Art Deco lobby of the Chrysler Building and by sharing the intriguing story behind its construction, which involved a 3-way race for the title of world's tallest skyscraper. Then, head to another world-famous landmark, Grand Central Terminal, and spend the next half hour or so exploring the largest railroad terminal in the world and a masterpiece of architecture and engineering. Here you'll visit the Main Concourse with its vaulted Milky Way ceiling as well as the unique Whispering Gallery. After leaving the Terminal, the tour then heads north along Park Avenue to the world-famous Waldorf Astoria Hotel ('the greatest of them all'), before making a turn to Fifth Avenue. 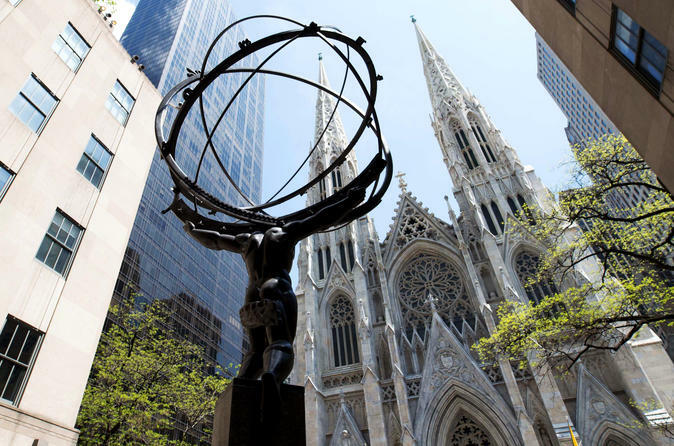 On Fifth Avenue, you'll learn about the beautifully restored Saint Patrick's Cathedral and the famous Art Deco sculpture of Atlas across the street. You will then explore Rockefeller Center and visit the Plaza and 30 Rockefeller Center. After, you'll walk a short distance to the so-called 'Center of the Universe,' better known as Times Square. There, hear about the building and company that gave the famous square its name, see where the ball is dropped on New Year's Eve and learn about the evolution and ups-and-downs of one of the most visited tourist sites in the world. After the hustle and bustle of Times Square, head east on 42nd street to enjoy a break in beautiful Bryant Park, where you'll learn about its sordid past and inspirational turnaround. Finally, wrap up outside the famous Beaux Arts masterpiece on Fifth Avenue: New York Public Library. After learning about the building, you will have a chance to visit the monumental building on your own and stroll through its marble halls to see one of the surviving copies of the Gutenberg Bible. Choose from a 3- or 4-hour tour with just you and your party.